Last spring I visited my mom fro the first anniversary of my dad's passing. She gave me a few knives of his, in which there as a puma white hunter completely rusted. 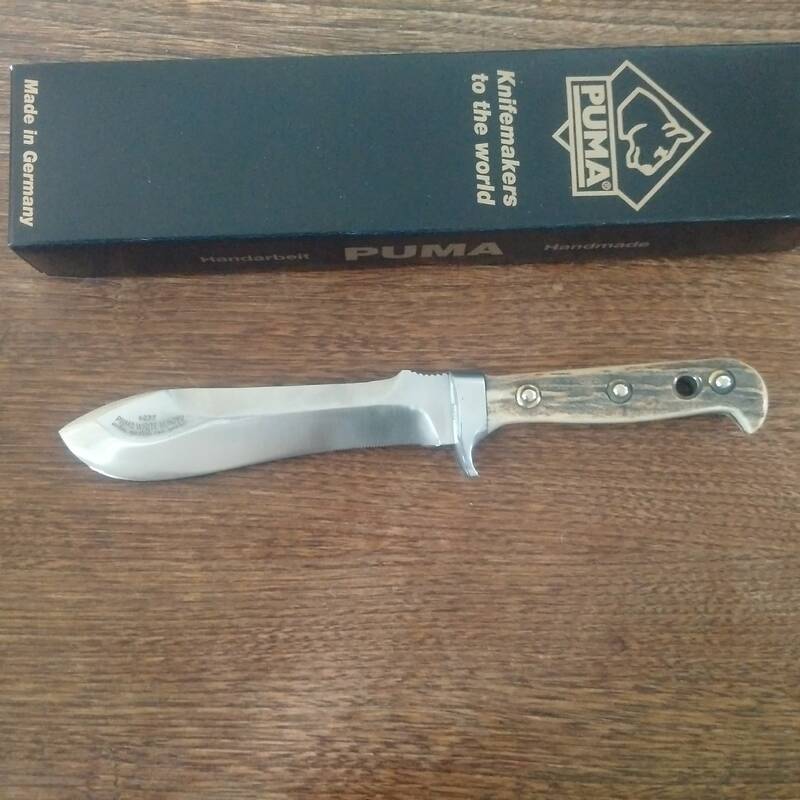 I emailed the folks at Puma, who dated it to the last quarter of 1966 and said the knives of that period were made of carbon steel, then chromed. No stainless they also suggested I send it over for a refurbish. Your Dad had great taste. Very nice, must be a special feeling holding that one in your hand. Thank you Mark, it is a special knife for me no doubt! Good looking knife. I had one like it back about that same time, but I lost it somewhere along the way. You have a great piece to help you remember your dad. I have my Dad's Marble hunting knife where he dated it 1935, Lake Geneva, WI on the sheath. My special one...it sure brings back memories when ever I hold it. Glad you got yours. Jeff, it was a pleasure to see you at Denton! I would carry that proudly on any hunt! Really nice!! Always wanted one of those. I keep looking. I had a mid-70s White Hunter I bought new but never used it. Eventually traded it to a buddy. With I had it back. Neat to have the one that was your dad's. My dad gave me a white hunter in the 60s and is rusty also I didn't know they could refinish them I will have to call also . Tim you will be amazed. The price is really cheap and they do a full refinish (and provide a new box too) within 3 weeks. I have a Hen and Rooster that appears to be a direct copy of the White Hunter. Same lenght, retaining strap, and the sheath looks the same. I was wrong. I pulled it from storage today, and the grip is different. It only has the forward and rear pins. It does not have the hole through the grip for the retaining leather thong, like the White Hunter and a 1970s model Puma Bowie I have. I need to pay more attention.